Jaiden Dale was born 14th January 2012 at 8.21am. Jaiden was such a happy and heathy little baby boy, he was always smiling and giggling. He loved his bottles and would demolish upto seven 6oz bottles a day! He had such a cheeky loveable personality and anyone who met him always commented on his gorgeous smile. At 4 months old the health visitor noticed Jaiden wasn't holding his head up on his own, if Jaiden was put on his front he wouldn't wriggle or attempt to move he would just struggle until I helped him. He was so alert and would know where sounds were coming from but he would only follow with his big blue eyes instead of moving his head. The health visitor gave me some little exercises to do with Jaiden and she would check on his progress in a month time, unfortunately Jaiden hadn't made any progress at all. Jaiden was referred to the paediatric in North Tees hospital and on my way through to his app Jaiden stopped breathing whilst I was driving. I immediately pulled over called 999 and tried my best to help Jaiden. It was the most terrifying moment of my life. After minutes went by Jaiden started to come round and I seen his smile again! The ambulance arrived and we were taken to North Tees where Jaiden had various blood tests and was put on monitors to keep check on his breathing. We spent a week in North tees then got transferred to the RVI Newcastle hospital where we were told the devastating news that Jaiden had SMA Type 1. 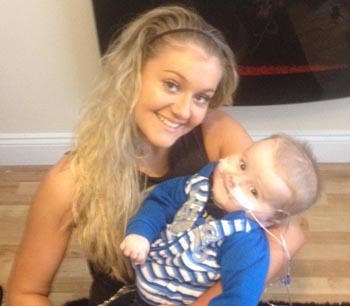 We spent 5weeks in the RVI where we were taught how to care for Jaiden. We had to learn how to do daily physio, how to do the feeds as Jaiden was taken off his bottles and instantly got tube fed ( wish I'm sure he missed his bottle) we were taught how to suction, how to do his medicines and how to save his life with bag and mask. After 5 weeks went by I finally got my little man home and comfy, I was petrified! I felt so scared knowing I didn't have nurses there to help me or Jaiden. He was relying on me and I didn't want to let him down.